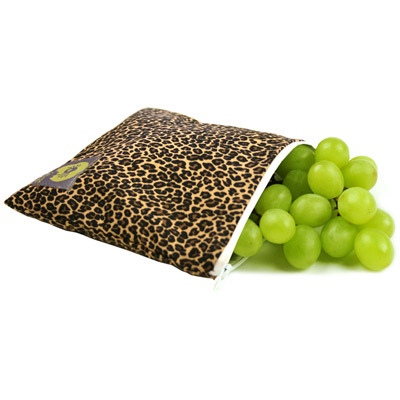 Itzy Ritzy has created a star with their new on-the-go Leopard print reusable snack bag. Designed to be easy for little hands to hold while keeping purses, diaper bags and lunch boxes free from crumbs and messy leaks. The designer cotton fabric exterior in a fun leopard print has a waterproof lined interior and zip top closure. Ideal for many uses: snacks, fruit, crayons, first aid kit, toiletries, iPod and cell phone. Machine washable.